TORONTO, ON – All across North America, the first Saturday of November is recognized as Learn to Homebrew Day, and the GTA Brews homebrewing club will be marking the date this year with a pair of events on either side of Toronto. 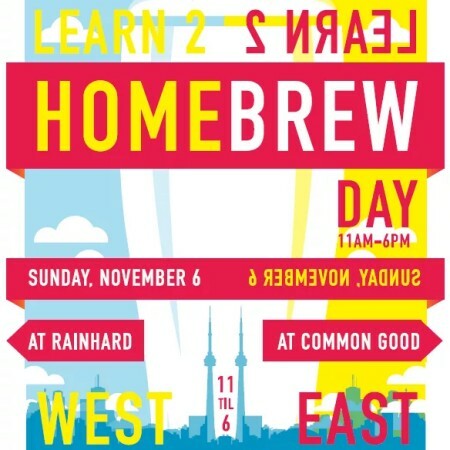 The 2016 Learn2Brew day will be taking place on Sunday, November 6th from 11:00 AM to 6:00 PM at Rainhard Brewing (100 Symes Rd.) and Common Good Beer (475 Ellesmere Road). GTA Brews will be showcasing a range of homebrewing techniques and equipment at both events, with on-site brewing demonstrations by local homebrewers. For more details on this year’s events, see the announcement on the GTA Brews website.